Show 208, January 28, 2017: Show Preview with Andy Harris, Co-Host & Executive Producer. Executive Chef Danilo Ibarra of the Marriott Vancouver Airport Hotel in Richmond. B.C. oversees The American Grille, The Lotus Land Lounge and all other food and beverage provided on-property. We’ll meet him. Dominique and Cindy Duby are the Chief Chocolate Officers of Richmond’s one-of-a-kind boutique chocolatier, Wild Sweets. They join us in sweet conversation. Executive Chef Angus An is the proprietor of Maenam, Vancouver Magazine’s selection for 2016 Restaurant of the Year and as the perennial Best Thai Restaurant. He’s had the honor of cooking at the James Beard Foundation in New York. We’ll talk about the flavor balance of Thai cuisine with Chef An as well as his growing restaurant empire. A popular visitor attraction in Richmond is the River Rock Casino Resort located on the Fraser River. There are eight tempting dining options there including the fine-dining Tramonto and Chinese specialties at Sea Harbor Seafood Restaurant. Karsten Purbs, River Rock’s Food & Beverage Director, is our able guide. Chinese, Taiwanese, Indian, Greek, Thai, Japanese, Italian – diners can enjoy authentic and delicious culinary styles from across the globe, without ever leaving Richmond. Richmond is home to more than 800 restaurants, half of them Asian and many highly acclaimed. Local food expert Lee Man, founding judge for the Chinese Restaurant Awards, joins us with commentary on Chinese New Year and the diversity of appealing cuisine in Richmond. January 28: Live from Richmond, BC and the Chinese New Year Celebration! Segment Four: Dominique Duby of Wild Sweets, Richmond, B.C. Segment Six: Karsten Purbs, Director, Food & Beverage, River Rock Casino Resort, Richmond, B.C. Segment Eight: Sommelier Rachel von Sturmer, Vancouver & Okanagan Valley, B.C. Executive Chef Angus An is the proprietor of Maenam, Vancouver Magazine’s selection as Best Thai Restaurant. He’s cooked at the James Beard Foundation in New York. We’ll talk about the flavor balance of Thai cuisine with Chef An as well as his growing restaurant empire. There is a burgeoning local wine industry in British Columbia. Sommelier Shiva Reddy, Wine Director & Assistant Manager of Royal Dinette (Vancouver Magazine’s Best New Restaurant 2016), uncorks this for us. BC wines are well represented on their menu. Dominique and Cindy Duby are the Chief Chocolate Officers of Richmond’s boutique chocolatier, Wild Sweets. They join us in sweet conversation. Chef Angus An is a graduate of New York’s prestigious French Culinary Institute, where he worked under the world’s culinary greats including Jacques Pépin, Alain Sailhac and André Soltner, and later apprenticed at Jean-Georges Vongerichten’s legendary Jo-Jo. After graduating from the FCI, Angus trained under Chef Normand Laprise at Montréal’s Toqué before moving to London, UK, where he worked at Michelin-starred restaurants including The Ledbury and The Fat Duck. Following this he cooked at Chef David Thompson’s famed Nahm, which is also where Angus met his wife, Kate. Upon returning to Vancouver, Kate and Angus opened their first restaurant, Gastropod. Lauded by diners and critics alike, Gastropod received several awards for cuisine and atmosphere before closing its doors in 2009. In May of that year, Maenam was born. Serving authentic Thai dishes, the kitchen at Maenam is directed by both Angus and Thai-born Kate. Perennial winner of Vancouver Magazine’s “Best Thai” award, Maenam has also received rave reviews from The New York Times, USA Today, and Food & Wine magazine. Chinese, Taiwanese, Indian, Greek, Thai, Japanese, Italian – diners can enjoy authentic and delicious culinary styles from across the globe, without ever leaving Richmond. Richmond is home to more than 800 restaurants, half of them Asian and many highly acclaimed. Local food expert Lee Man, founding judge for the Chinese Restaurant Awards and contributor to Vancouver Magazine, joins us with commentary on Chinese New Year and the diversity of cuisine in Richmond. 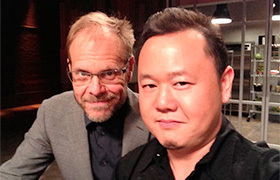 Lee is also a judge for the Vancouver Magazine Restaurant Awards. Our regular Contributor on the San Diego dining scene, Anita Lau, The Mad Hungry Woman blogger, joins us. She will provide us with the highlights of a magnificent Chinese New Year banquet she enjoyed with colleagues as well as profiles a bakery/café with an Irish twist that’s one of San Diego’s hottest brunch spots. Anita’s brunch discovery is Chef Maeve Rochford’s Sugar and Scribe in La Jolla. Chef Maeve was the winner of Season 2 of Food Network’s “Holiday Baking Championship.” She is also very prominent in the expatriate Irish community in California. In addition to the crave-worthy baked goods Chef Maeve features recipes from her Irish grandmother. Think Rochford’s Shepard’s Pie and Erie Hash. When Anita is not writing or researching food she serves as Co-President of the Los Angeles / Orange County Chapter of Les Dames d’Escoffier. Read both restaurant profiles with mouthwatering photos on Anita’s Website. Executive Chef Andrew Gruel of the rapidly growing Slapfish empire with restaurants in Huntington Beach, Laguna Beach, and now, Newport Beach is today’s special Guest Host. Chinese New Year is February 19th to March 5th, 2015. It’s the Year of the Sheep (often called the Year of the Goat or the Ram.) During China’s most colorful and important holiday, foods take on special symbolic meanings. Fruits and vegetables are also healthy and delicious. Our resident produce expert, Robert Schueller of Melissa’s, joins us with a tasty overview of fruits and vegetables which are part of Chinese New Year. He’ll also tell us where to find some inspired Martin Yan recipes to prepare at home to celebrate Chinese New Year. Eric Samaniego (ex- Comme Ca in West Hollywood) is the acclaimed Executive Chef of Little Sparrow in Santa Ana. The Orange County Register’s Restaurant Critic, Brad A. Johnson, awarded Little Sparrow recognition as “Best New Restaurant” in 2013. Samaniego’s Pastry Chef, Nasera Munshi, was Johnson’s choice as “Pastry Chef of the Year” in 2014. If all of that wasn’t enough recognition Little Sparrow was selected by the producers (including Tom Colicchio) of Bravo’s “Best New Restaurant” competition series as one of 16 USA restaurants from four cities to vie for the title of Best New Restaurant and a cool $100,000 cash prize. With eager anticipation we’ll see how Little Sparrow does in their initial episode airing on Wednesday evening. Feb. 25th. When we last chatted with Team USA (Chefs Philip Tessier and Commis Skylar Stover of The French Laundry) early last month they were on their way to Lyon to compete in the bi-annual Bocuse d’Or World Culinary Competition, the Olympics of the culinary world. This was after a year of intensive preparation and dedicated training. 24 teams of the most gifted culinary minds from across the world competed and Team USA (guided by the ment’or BKB Foundation) was awarded the Silver Medal (second place) for their artful and spectacular meat platter and fish plate. Team Norway was the first-place winner. This is a giant first for Team USA. Their previous top finish was sixth. Congratulations to Team USA on a stunning achievement. Chef Tessier is our guest. Chef Jason McClain is the executive chef of the storied Jonathan Club, a very exclusive private club in Los Angeles established in 1894 with a rich history. Their main building is located in Downtown Los Angeles with a second facility, the Jonathan Beach Club (established in 1927) located on the sands in Santa Monica. A social club at this level needs to have outstanding food and beverage as an amenity for their discerning members. Chef McClain will take us behind the scenes on what resources and imagination he uses to fulfill this promise. He likes to say he’s responsible for “the best restaurant in Downtown that no one knows about.” One small example of his commitment to quality is his urban rooftop garden located on a former handball court where seasonally they grow heirloom tomatoes, broccolini, baby carrots, blueberries, figs, snap peas and yuzu. Julie Margolin is the Honda Center’s busy Director of Food & Beverage Services. Over 500 employees are part of the food and beverage operations there. Honda Center is one of the few facilities in the country who runs their own food and beverage operations. It’s a massive undertaking and costly. This was done strictly to improve the quality of the food and beverage program there. She works alongside Honda Center’s Executive Chef, Jo-Jo Doyle. Julie joins us to talk about what’s new for the current season including the menu in Standing “O”. We now have a chance to catch-up with Chef Andrew Gruel of Slapfish, today’s Guest Host. The U.S. Department of Agriculture is considering a set of rules for organic farmed fish. Several consumer groups, though, say the recommended rules don’t go far enough to meet the strict standards of other organic foods. Chef Andrew will weigh-in on this and also speak about sustainability. Chinese New Year is February 19th to March 5th, 2015. It’s the Year of the Sheep (often called the Year of the Goat or the Ram.) During China’s most colorful and important holiday, foods take on special symbolic meanings. Fruits and vegetables are also healthy and delicious. He’ll also tell us where to find some easy-to-prepare Martin Yan recipes to enjoy at home to celebrate Chinese New Year. Chinese New Year is February 19th to March 5th, 2015. It’s the Year of the Sheep (often called the Year of the Goat or the Ram.) During China’s most colorful and important holiday, foods take on special symbolic meanings. Fruits and vegetables are also healthy and delicious. Our resident produce expert, Robert Schueller of Melissa’s, joins us with a tasty overview of the fruits and vegetables which are part of Chinese New Year. He’ll also tell us where to find some great Martin Yan recipes to prepare at home to celebrate Chinese New Year. Eric Samaniego (ex- Comme Ca in West Hollywood) is the acclaimed Executive Chef of Little Sparrow in Santa Ana. The Orange County Register’s Restaurant Critic, Brad A. Johnson, awarded Little Sparrow the recognition as “Best New Restaurant” in 2013. Samaniego’s Pastry Chef, Nasera Munshi, was Johnson’s choice as “Pastry Chef of the Year” in 2014. If all of that wasn’t enough recognition Little Sparrow was selected by the producers (including Tom Colicchio) of Bravo’s “Best New Restaurant” competition series as one of 16 USA restaurants from four cities to vie for the title of Best New Restaurant and a cool $100,000 cash prize. With eager anticipation we’ll see how Little Sparrow does in their initial episode airing on Wednesday evening. Feb. 25th. When we last chatted with Team USA (Chefs Philip Tessier and Commis Skylar Stover of The French Laundry) early last month they were on their way to Lyon to compete in the bi-annual Bocuse d’Or World Culinary Competition, the Olympics of the culinary world. This was after a year of intensive preparation and dedicated training. 24 teams of the most gifted culinary minds from across the world competed and Team USA (guided by the ment’or BKB Foundation) was awarded the Silver Medal (second place) for their artful and spectacular meat platter and fish plate. Team Norway was the first-place winner. This is a giant first for Team USA. Their previous top finish was sixth. Congratulations to Team USA on a stunning achievement. Chef Philip Tessier is our guest. Chef Jason McClain is the executive chef of the storied Jonathan Club, a very exclusive private club in Los Angeles established in 1894 with a rich history. Their main building is located in Downtown Los Angeles with a second facility, the Jonathan Beach Club (established in 1927) located on the sand in Santa Monica. A social club at this level needs to have outstanding food and beverage as an amenity for their discerning members. Chef McClain will take us behind the scenes on what resources and imagination he uses to fulfill this promise. He likes to say he’s responsible for “the best restaurant in Downtown that no one knows about.” One small example of his commitment to quality is his urban rooftop garden located on a former handball court where seasonally they grow heirloom tomatoes, broccolini, baby carrots, blueberries, figs, snap peas and yuzu. We now have a chance to catch-up with Chef Andrew Gruel of Slapfish, today’s Guest Host. Andrew will announce the name and description of the winning dish created for the opening in Newport Beach. The U.S. Department of Agriculture is considering a set of rules for organic farmed fish. Several consumer groups, though, say the recommended rules don’t go far enough to meet the strict standards of other organic foods. Chef Andrew will weigh-in on this debate. 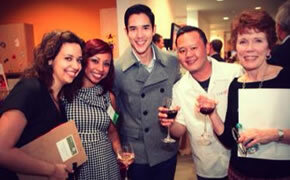 Eric Samaniego (ex- Comme Ca in West Hollywood) is the acclaimed Executive Chef of Little Sparrow in Santa Ana. The fare is original versions of regional and seasonal French and California cuisine. The menu changes often. Dinner nightly (except Sunday and Monday) from 5:00 p.m. and Sunday Brunch. The Orange County Register’s Restaurant Critic, Brad A. Johnson, awarded Little Sparrow recognition as “Best New Restaurant” in 2013. Samaniego’s Pastry Chef, Nasera Munshi, was Johnson’s choice as “Pastry Chef of the Year” in 2014. If all of that wasn’t enough recognition Little Sparrow was selected by the producers (including “Top Chef’s” Tom Colicchio) of Bravo’s “Best New Restaurant” competition series as one of 16 USA restaurants from four cities to vie for the title of Best New Restaurant and a cool $100,000 cash prize. With eager anticipation we’ll see how Little Sparrow does in their initial episode airing on Wednesday evening. Feb. 25th. When we last chatted with Team USA (Chefs Philip Tessier and Commis Skylar Stover of The French Laundry) early last month they were on their way to Lyon to compete in the bi-annual Bocuse d’Or World Culinary Competition, the Olympics of the culinary world. This was after a year of intensive preparation and dedicated training. 24 teams of the most gifted culinary minds from across the world competed and Team USA (guided by the ment’or BKB Foundation) was awarded the Silver Medal (second place) for their artful and spectacular meat platter and fish plate. Team Norway was the first-place winner. Team USA competed on January 27th. This is a giant first for Team USA. Their previous top finish was sixth. Congratulations to Team USA on a stunning achievement. Chef Philip Tessier, just back from Lyon, Paris and New York is our very special guest. 24 teams of the most gifted culinary minds from across the world competed in the Bocuse d’Or Culinary Competition (the culinary Olympics) in Lyon last week and Team USA (guided by the ment’or BKB Foundation) was awarded the Silver Medal (second place) for their artful and spectacular meat platter and fish plate. Team Norway was the first-place winner. Team USA competed on January 27th. This is a giant first for Team USA. Their previous top finish was sixth. Their stunning meat platter was Barrel-Oak Roasted Guinea Hen. Some of the garnishes were French Laundry garden blossoms and herbs. The gorgeous fish plate showcased Brioche-Crusted Brown Trout Pave with American caviar, tartelette of crisped skin, garden dill, celery branch “Farci,” celery root puree, compressed apples, brown butter emulsion, and smoked mushroom consomme. Both the meat platter and the fish plate were designed by the lauded Martin Kastner. Julie Margolin is the Honda Center’s busy Director of Food & Beverage Services. Before joining Honda Center Margolin was with Levy Restaurants as part of the opening team at Barclays Center in Brooklyn. Over 500 employees are part of the food and beverage operations there. Honda Center is one of the few facilities in the country who runs their own food and beverage operations. It’s a massive undertaking and costly. This was done strictly to improve the quality of the food and beverage program there. She works alongside Honda Center’s Executive Chef, Jo-Jo Doyle. Julie joins us to talk about what’s new for the current season including the menu in Standing “O”. Also there is a newly opened Wahoo’s Fish Taco at Honda Center. They are a new franchisee of Wahoo’s. We now have a chance to catch-up with Chef Andrew Gruel of Slapfish, today’s Guest Host. Andrew will announce the name and description of the winning dish created for the opening in Newport Beach. It’s soon on the menu there. The U.S. Department of Agriculture is considering a set of rules for organic farmed fish. Several consumer groups, though, say the recommended rules don’t go far enough to meet the strict standards of other organic foods. Chef Andrew will weigh-in on this. Jet shared his extensive adventures of the week. On Monday and Tuesday he was in-person at the legendary commissary on the lot of Paramount Studios in Hollywood. He presented his menu for Chinese New Year there. The menus continued to be served for the balance of the week. On Thursday he was the celebrity guest chef on campus at Oregon State University in Corvallis. Jet performed cooking demos, taught classes, and represented his menu on campus for Chinese New Year. Jet’s visit generated so much local interest that the TV station in Eugene sent a reporter and photographer there to cover it! Saturday morning, before the radio show, Jet was at NBC 4 in Burbank for a cooking segment on Chinese New Year for “Today in L.A. Weekend” which aired around 7:45 a.m.
Average Betty shared a Valentine’s Day tip. She loves to dine out but she suggests Valentine’s Day is a good occasion to cook a wonderful meal at home for that special someone. Restaurants are really stressed with preparing special menus on Valentine’s Day anyway. Jet has been cooking up and down the West Coast this week from the legendary studio commissary at Paramount Pictures in Hollywood to the campus of OSU in Corvallis, Oregon. He’ll share a few of his observations from the road. Finally, Orange County’s rebel baker is in-studio. What a story of tenacity she has to share with us! Sara O’Donnell of Average Betty has conquered YouTube with her series of humorous and highly entertaining shorts on cooking. YouTube has been so impressed with her work that she was chosen to go through their coveted training program. As a result of her success she was given high value equipment to increase the production values in her segments! She makes it look easy but it requires talent, a point-of-view and a lot of advance preparation. Sara is with us to give us the background on the unlikely success story that is Average Betty! One of the most distinct honors a chef can have in the United States is to be invited to prepare and cook a multi-course meal at The James Beard Foundation in Manhattan for a group of highly discriminating diners. James Beard is considered the “Father of American Gastronomy” by many pillars of the contemporary food world. 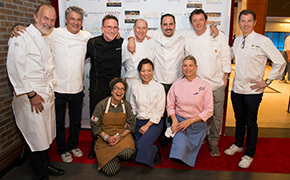 Andrew Sutton, the founding executive chef of the stellar Napa Rose at Disney’s Grand Californian Hotel in Anaheim, was at the Beard House on January 30th as part of the (mostly Orange County-based) culinary team cooking the “Salmon Seduction” evening. Andy will share that special experience with us and it’s not the first time he’s been there. Chinese New Year has had Jet on the road this past week. Monday and Tuesday he was the celebrity guest chef at the commissary at Paramount Studios in Hollywood with his Chinese New Year menu as the featured lunch special. The menu changed daily and continued for the week. On Thursday Jet was in Corvallis on the campus of Oregon State University. Again, he was the celebrity guest chef in residence to celebrate Chinese New Year. He taught cooking classes for the students as well as conducted some entertaining demos. His Chinese New Year menu was featured on campus as a special celebration for Thursday evening. On the show it’s a joy to share local food success stories. Saturday we’ll meet the amazing Rachel Klemek of Blackmarket Bakery in Irvine and at The Camp in Costa Mesa. In 2004 she started out with a small production bakery for wholesale customers in a hidden location in an industrial park in Irvine. Word-of-mouth for her creations grew quickly. Aficionados swoon over her cakes, decadent pastries, and fresh breads. Rachel’s signature Marche Noir Cabernet brownies are pretty incredible, too. Her first planned retail location at The Camp actually debuted in early January but Rachel is having the Grand Opening celebration on Monday, February 11th from 5:30 p.m. to 7:30 p.m. 15 per cent of all sales during the festivities will be donated to Share Our Selves.